Summer is settling in most parts of the country and temperatures are rising. Even when it’s hot and sweltering outside you can still create a serene oasis inside your house by focusing on a cool color palette. 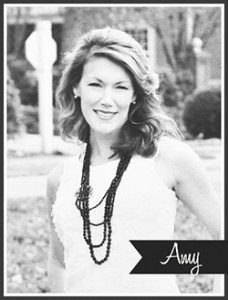 Over at 11 Magnolia Lane, Christy and I both lean toward cooler colors in our decor. In our homes you’ll see pale blues, grays and quite a bit of cream and white. We use these colors year-round, the colors of the sea and the coast, and they make for a nice soothing indoor palette when the heat of summer rolls in. In most homes life revolves around the kitchen–even when it’s just to hot to think about cooking! 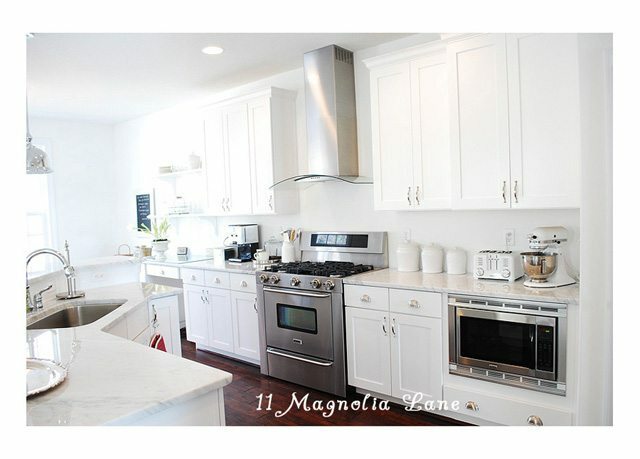 Our kitchens always feel cooler with white cabinets, accessories and neutral decor. Stainless appliances and chrome lighting (above) in our former kitchen from our coastal home feel cool even after a day at the beach. 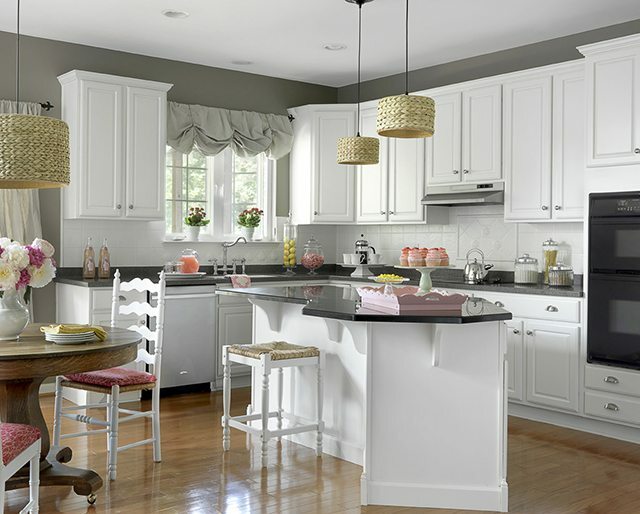 Christy’s former kitchen (below) used seagrass and other coastal touches with the bright white cabinets to keep the space feeling relaxed even on the hottest days. 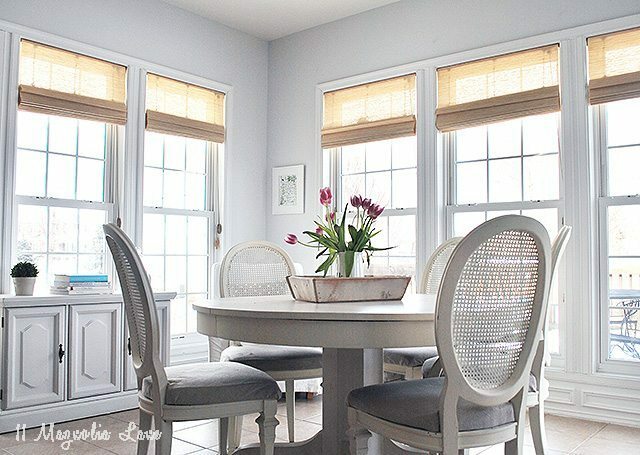 In our current home our breakfast room has pale icy blue walls and woven shades making the space soothing and relaxing. The shades block the heat of the sun, and the pale walls and white furniture make the room feel a bit like an indoor porch, an air-conditioned one at that! On the table, a summery tablescape makes impromptu meals easier when dining inside is the only option. 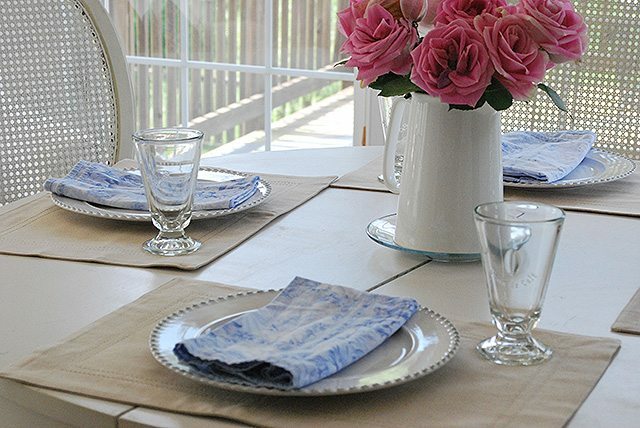 The pale blues mixed with woven mats brings in the colors of the beach, perfect for a light summer meal. In the corner of the room, a comfortable chair with a white slipcover provides a place for a quiet moment on a hot day, even while the temperatures rise outside, inside feels quiet and cool. In our kitchen the marble backsplash has an icy feel. 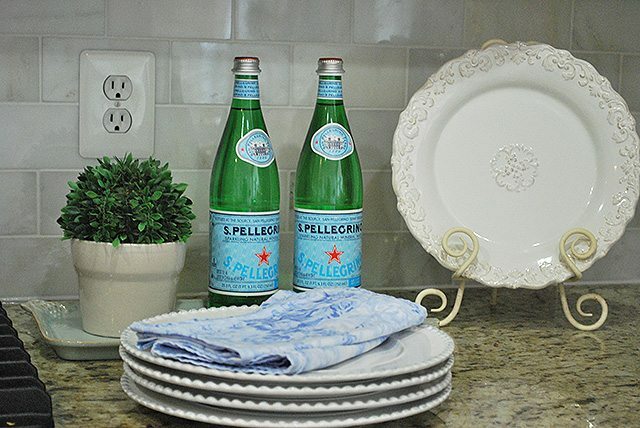 A simple, summer vignette offering refreshing drinks adds to the cool, summery feeling of the space. 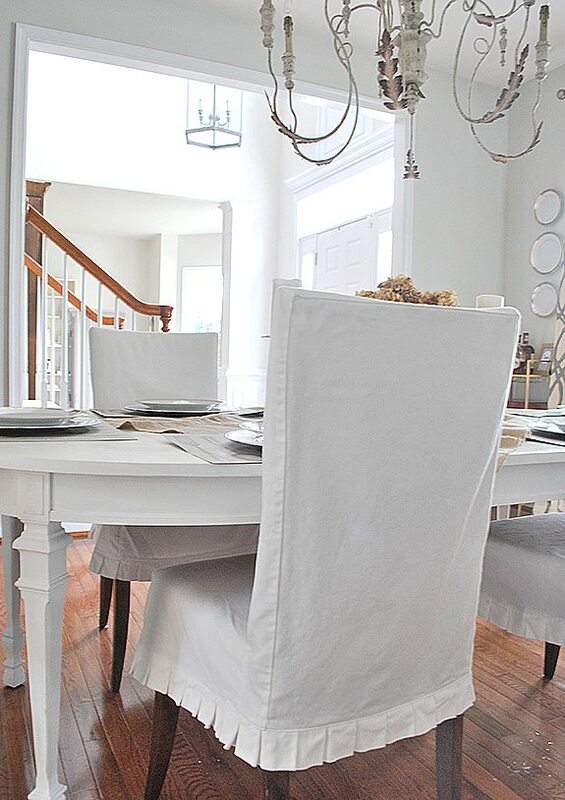 Nearby in the dining room, dark formal chairs are covered with white slipcovers for a lighter look during the warmer months. 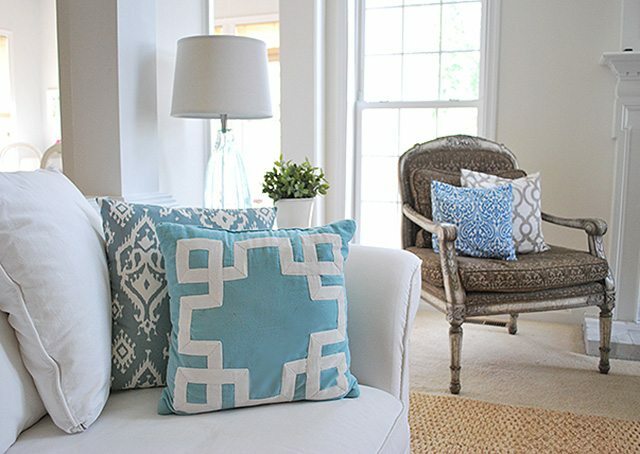 In the warmer months blue and white accents are mixed into our living spaces, freshening up our winter decor of mostly neutrals such as gray, black and white to flow with the season. Bedrooms are especially important to make restful on hot days. 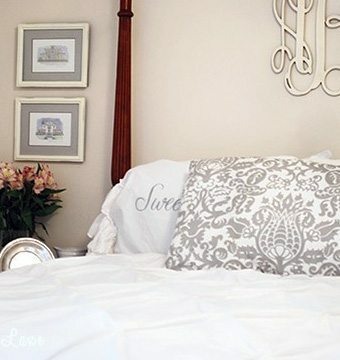 White bedding is always in style and in the summer months, nothing is as refreshing as crisp, cool, white sheets. 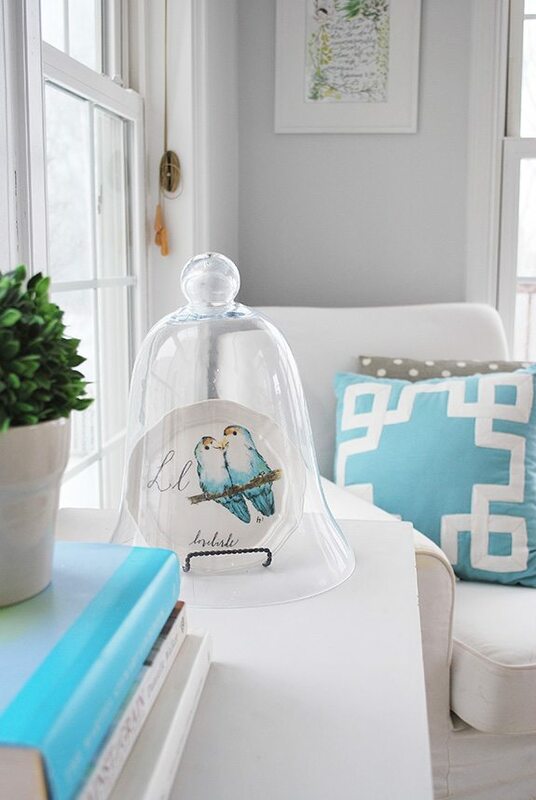 Some icy gray adds interest to this guest room and when mixed with silver decorative accents, it creates a welcoming and restful space for summer visitors. 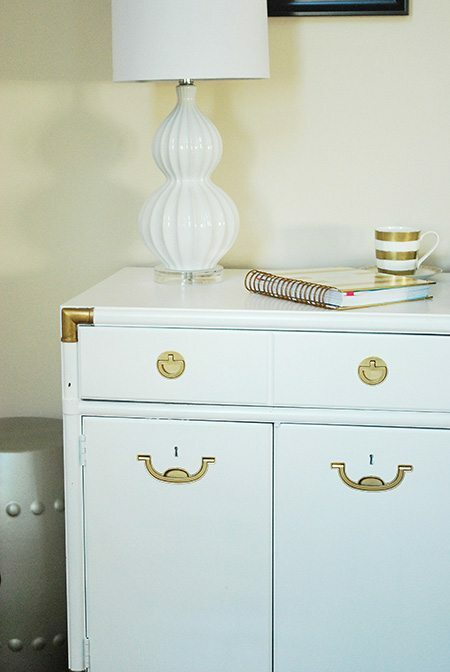 Just like white bedding is always a refreshing choice, white furniture provides a cool backdrop at anytime of the year but especially in the summer, it keeps rooms feeling light and clean. 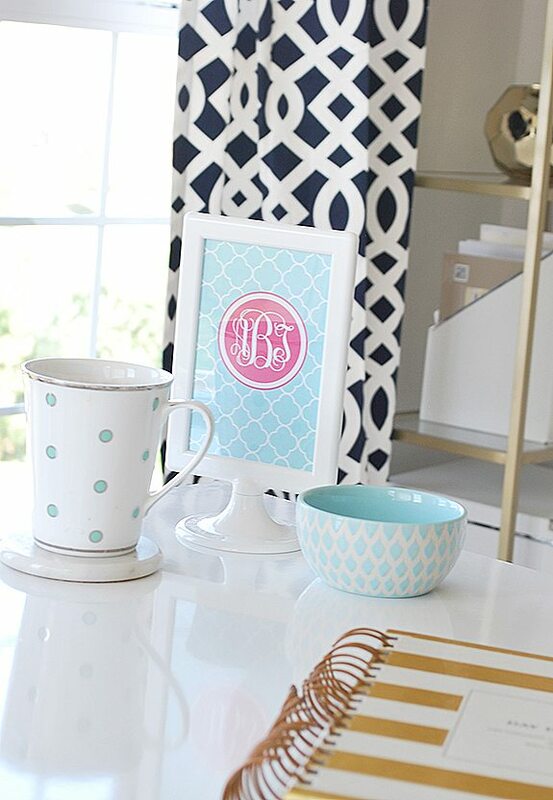 A white desk and soft coordinated desk accessories make for a serene workspace– if you must work in the summer, a calm space to do it in makes it more pleasurable. In our home our guest bathroom revolves around cool decor. The walls are painted a very pale blue and the fixtures are cool marble and shiny chrome. 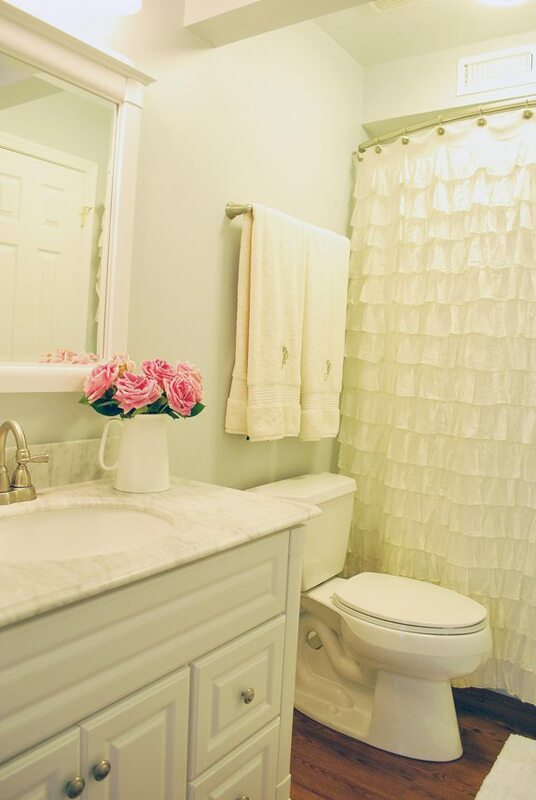 The lightness of the ruffled shower curtain makes it a relaxing, spa-like space. 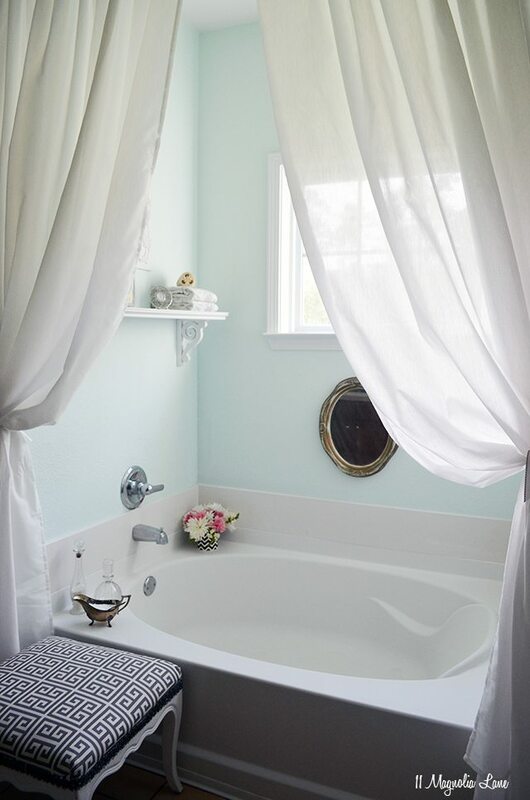 In Christy’s master bath, a pale sea-like paint color and lightweight sheer curtains add interest to the tub nook. This space has a resort feel, it’s the perfect spot to unwind after a long, hot day. As summer rolls in, incorporating cool coastal colors in your decor will see you through the hottest days. For more of our homes, please feel free to visit us at 11 Magnolia Lane, and stay cool this summer!